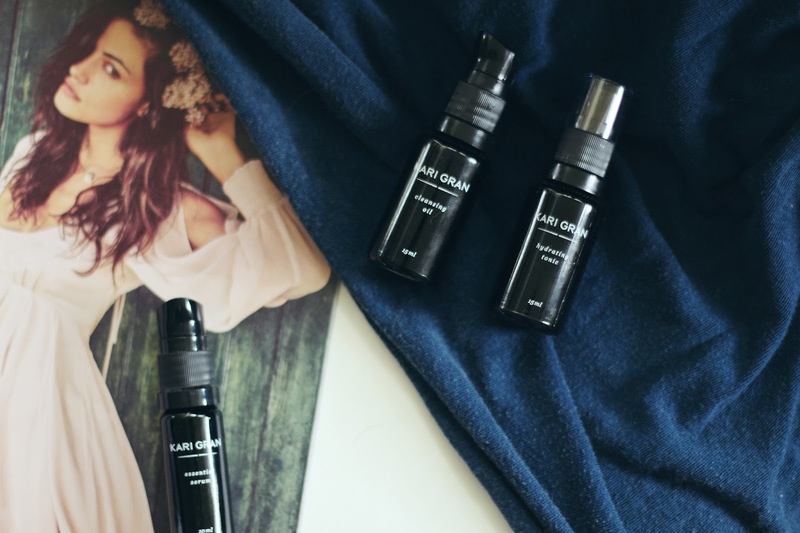 Today I want to talk a bit about a brand that I've mentioned in the past, but with their beautiful formulas and products I felt it deserved it's own post. Kari Gran is a line I was introduced to awhile ago, and one that I am psyched to announce I'll be selling over at Healuxe Beauty. With a full range of natural skincare and makeup products, this is a brand everyone of all skin types can use and enjoy. For the past month I've been using their Starter Travel Kit* which includes their best selling Cleansing Oil, Hydrating Tonic and Essential Serum, and I couldn't be happier with the results. The Hydrating Tonic is made up of a blend of lavender oil, aloe vera and vegetable glycerin to make a gentle yet deeply cleansing toner. The Essential Serum is jam packed with goodies such as (just to name a few) lavender oil, calendula oil, rosehip oil and sea buckthorn oil. You might recognize a few of these as some of my most beloved and widely used ingredients - I have been sold on products in the past just based on their use of these, they are such great oils for skin in need of a reboot. So it came as no surprise that I ended up adoring this serum, which absorbs quickly and is perfect to use during the day underneath makeup. It's superbly hydrating and leaves your skin more even and simply glowing from the inside out. You really only need a bit of this gem of a formula, so luckily this travel size is still working for me after almost daily use! As much as I am head over heels for the serum, possibly my favorite part of the trio has to be the brand's Cleansing Oil. I've always been a sucker for cleaning oils - they just work so fantastically for my dry skin, and I find them to be the hands down best way to remove makeup at the end of the day. This particular formula is made up of three oils, sunflower, avocado and castor seed. These are all ideal oils for a truly deep cleanse, leaving no oily residue or grime in their wake. I've been turning to this travel size daily for the past month and am only just starting to run out, meaning a full size purchase is definitely in order. Along with the trio, I've been trialling two of the brand's Lip Whips* in Peppermint Tinted and Cinnamon Pimenta Berry. The lip whips come in several different shades, with the option of peppermint or cinnamon flavoring, and include ingredients such as Vitamin E, calendula, avocado and castor seed oils. While I am not personally a big cinnamon fan (though I know many that are!) I cannot rave enough about how much I enjoy the peppermint version! It's minty fresh, and leave my lips looking (and feeling) absolutely incredible. I've made it well known that my lips are in a constant state of disarray, but this has been one product that has left them seriously hydrated and soft. Big thumbs up from me! Have you guys tried anything from Kari Gran before? I cannot wait to try out more makeup options from the brand, as I've been so impressed with what I've trialled thus far!